Get a toilet paper roll tube, the bigger the better. Draw a circle on a hardboard box, cut and paste. 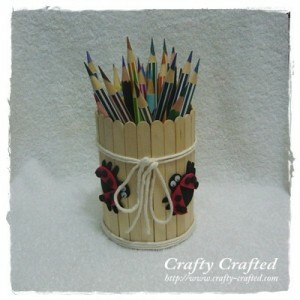 Put an elastic band in the middle and insert the craft sticks. The band is to hold the sticks in place. Glue the craft stick all around the toilet paper roll tube. Tie a string around it. And you are done. You may also add some little bugs as deco. wow… we did this kind of craft last month and we really had so much fun doing it. by the way…i am planning to send an art craft to your email this week..
Love the popsicle stick creations. Thank you.